Yes, I admit it: I have actually watched it. Watched what, you may ask? Why, The Yule Log, of course! There are few childhood holiday memories that stick out more in my beer-drenched memory than that of the annual ritual before the television set every Christmas Eve. At precisely nine o'clock in the evening, my mother and sister would fix themselves a glass of eggnog or wine and plump themselves down to watch the Yule Log on Channel 11, which broadcasts out of New York City . Although it was never my first choice of programming, as a mere kid at the time I was pretty much a captive audience. For the next two hours, our living room was treated to an assortment of Christmas carols while the phony fireplace in TV land burned brightly. 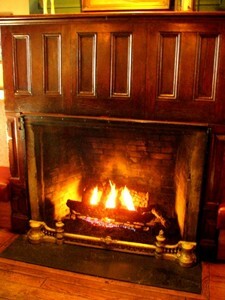 At first, I was actually naïve enough to believe that the presentation featured a real hearth burning live, until my brother Stuart astutely noticed that an identical small flame would eject from the side of the fire at exact fifteen second intervals, thereby exposing the fireplace as nothing more than a taped loop. Undaunted by that sobering revelation, my family would continue for many a year to sing and drink along with the looping log, until the show's eventual cancellation. In recent years though, Channel 11 has become sentimental and has revived this sacred holiday tradition, no doubt in order to delight and enchant a whole new generation of die-hard Yule Log fans far across the land. Now in my middle-aged years, my childhood wonderment with the holiday season has admittedly given way to a certain degree of cynicism as I have watched with dismay at the insane rush of holiday shopping and commercial promotions. However, rest assured that I have not quite yet devolved into a modern incarnation of Ebeneezer Scrooge. There are still many methods available to capture the Yuletide spirit if one is willing to seek them out. For me, one of the best ways to do this is through my yearly enjoyment of the wonderful brews that the season has to offer. Christmas beers pretty much run the gamut of styles and flavors; there are no hard-and-fast rules for what such brews are supposed to be, other than interesting and sometimes unique in character. They are typically higher in alcohol than conventional strength beers, although they are not always so. As long as they manage to evoke images of hearty cheer, peace on Earth and good will toward men, they have successfully accomplished their mission! 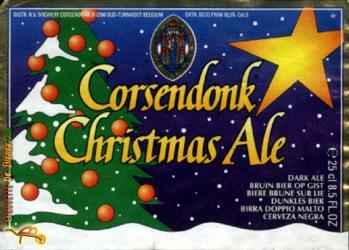 One superb example of such a fermented holiday classic is the Corsendonk Christmas Ale brewed by Du Bocq of Belgium. Corsendonk, the name brand of an excellent line of abbey-style ales, frequently feature on their beer bottles an etched picture of the Madonna and Child, giving their brews an almost religious imagery. Once you've had the pleasure of trying their Christmas Ale it's easy to understand why. Corsendonk's dark amber offering is beautifully rich and strong, with a profound bubblegum-like fruitiness balanced by a restrained hoppiness that is just enough to impart a touch of spiciness. I have even enjoyed this stellar ale on draught in the past and can attest that it is not to be missed, whether you are devoutly pious or just a wayward heathen looking for a heavenly taste experience! Hürlimann in Switzerland). “Samichlaus” means “Santa Claus” and it is indeed a rare gift to savor, although it is strongly recommended that it be done so in measured doses of moderation! 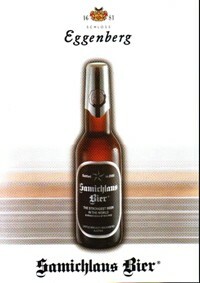 Samichlaus has long boasted its status as one of the strongest bottom-fermented lager beers ever brewed, with some samples actually clocking in at over fourteen percent alcohol by volume. Samichlaus is only brewed once a year on December 6, and is cold-conditioned for ten full months before it is released for sale. Its long maturation makes for a surprisingly smooth beer for one of such dizzying potency, and the residual malt sugars create a delicious flavor of moderate sweetness that works best as an accompaniment for dessert, or even as a dessert in itself. However, this brew can stupefy the senses quickly, so be careful to be sitting down on a secure chair while quaffing it! If you've ever wondered why Saint Nicholas always seems to be sporting such a red nose, this beer must surely be the reason why. Not to be outdone, there is a great variety of delectable Yuletide offerings to be found on this side of the Atlantic as well. No such list would be complete without mentioning the celebrated Christmas Special Ale of the Anchor Brewing Company of San Francisco. Anchor's beer is always specifically dated for each year that it is made, and it is brewed from a new and unique recipe every season, thereby ensuring that no two versions are ever exactly the same. Although the formulations are kept secret, it is known that Anchor liberally uses a variety of spices in various combinations, such as spruce, ginger and coriander, among others. Its only consistency is its repeated excellence year after year! 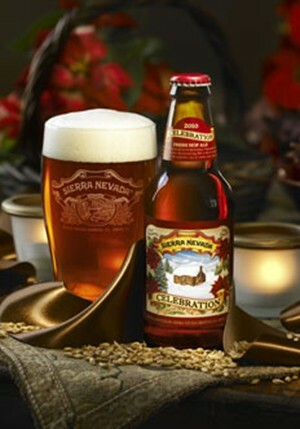 Another superb American seasonal worthy of high praise is the Celebration Ale brewed by the Sierra Nevada Brewing Company of Chico, California. Celebration is brewed to a slightly higher than conventional strength of just under seven percent ABV, and relies on its lush hop character rather than spices to produce its distinctive flavor. While technically classified as an India pale ale, it features a more pronounced maltiness than many examples of that style, creating a wonderfully balancing undercoating to the fresh, almost pine-like hoppiness that this ale exudes. Celebration is punctuated by a rich floral scent as well, courtesy of the generous additions of fresh aroma hops. I suppose that it would be somewhat irresponsible of me to over-emphasize copious beer consumption during the holidays. After all, most of us can recall at least one member of our family that had a habit of hitting the sauce a bit too much during the festivities, and causing a somewhat embarrassing scene as a result. However, there is no reason why the reasonable imbibing of delectable holiday beers cannot be a part of everyone's Yuletide merriment and camaraderie. After all, if old Ebeneezer himself had allowed himself to lighten up and enjoy a few, perhaps he needn't have had to be visited by those three ghosts in the first place! To all our readers of American Public House Review, here's hoping you have a most joyous Holiday season and the best of health and success in the New Year!